Must Reading: Paul Matthews' "The Cycle of Get"
Most composer-on-composer crime in the university happens in private meetings. These are personnel issues in which the participants are sworn to confidentiality. Sometimes these ethical bonds are so strong, it takes both gin and tonic to dissolve them. We’ve all heard the stories, spread with suspicious annotations like the fingerings in cheap editions of Mozart’s sonatas. But when these matters do not concern employment, public speculation and second-guessing is only inhibited by tact. And tact, it turns out, is a poor inhibitor. This substantial article by Paul Matthews is filled with lots of entertaining puns and turns of phrase, but they clothe many really important statements about music and the musical life. 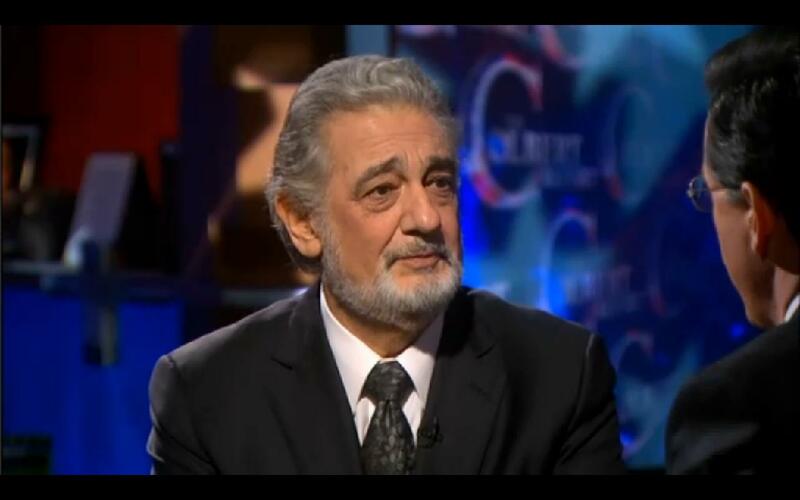 After hearing Placido Domingo and Stephen Colbert sing together, I was pleased as punch to find this interview transcript. You will need to scroll down a bit to read it. It seems that the very first thing we learn about teachers is that they have authority over students. As children we have all experienced the powerlessness connected with being "judged" by our teachers. Obedience from students is highly valued in a classroom music situation because it gives the instructor the illusion that the students understand the musical directions and are eager to act upon them. Students learn early on (and sometimes against their better judgement) that the conductor or leader of a group is the one making the music, and that it is the role of a good "team player" to go with the flow and follow directions. What I have noticed from my perch on the other side of childhood, is that the end product of this kind of teacher-student relationship can result, if it is is not immediately addressed, in musical passivity and lack of musical awareness on the part of students. It also results in people who develop the desire to become school band and chorus directors for the perceived power connected with such a position. I was very lucky as a child. I had formal music teachers who taught their students to listen to one another. I had formal music teachers who were in the business of teaching music because they loved the true expression that results when young people love what they were doing, whether it be singing or playing. I don't recall any of my elementary chorus teachers or orchestra teachers having to establish authority, because everyone participating in their ensembles (which were all after school ensembles) were there to make music. The vocal ensembles I sang with throughout my time in Junior High and in High School (in Newton, Massachusetts) were exceptional. What did the kids in them do for fun? We got together for parties and sang the music we knew. There was no "director" when we did this. We followed the piano (and there was usually a kid who could play the piano accompaniments). I admired and respected my musical colleagues, and I loved making music with them. Perhaps this early indoctrination into cooperative music making has caused me to value the cooperative musical experience: the idea that participating in a chamber music ensemble means that every person has the obligation to contribute to the interpretation, and nobody is the "authority." Even as a composer I do not feel the need to be the "authority" in a musical situation. Why is it that young musicians tend to have difficulty with this? Why must a small performing group have a leader? Could it be the practices of the musical hierarchies at higher academic institutions? Could it be the importance given to the "lesson plan," something people learn in music education classes? Could it be that the "authority" role is given to the composer, who, often being dead has to have his or her "authority" interpreted by a single human being armed, at times, with a set of rules? When I play in an orchestra I do follow the conductor and I follow the bowings of the section leader. I feel that in an orchestra (made of many playing the same part) the best contribution I can make is to play the notes, rhythms, articulations, and dynamics in my music, blend with my stand partner, and give energy to the sound of the section as a whole. But the difference between section playing and chamber music, where everyone plays his or her own part, is that everyone is responsible for keeping the tempo, everyone is responsible for playing together, and everyone is responsible for the interpretation. I have found that music making improves exponentially when everyone has a stake in the interpretation, and the experience is often less than satisfying when there is one leader among the people playing or singing who takes "ownership" of the situation. Perhaps it is difficult to teach cooperative chamber music playing in a university situation. Chamber music ensembles in university settings often have coaches, and students usually rely on those coaches (who usually do know a lot if they are coaching chamber music in a university situation) to tell them what to do. A coach who comes to a rehearsal and tells the ensemble that they need to work their interpretation out amongst themselves might not be the kind of coach that would produce the best results. When coaching it is really difficult not to make suggestions (especially when those suggestions might really improve things). Left to their own devices, and without the presence of an authority figure, some students might not take a musical situation seriously (i.e. learn his or her part, remain focused on the task at hand, or even show up for rehearsal). When everyone is at the same "rank" in an essentially hierarchical situation, students may not respect one another enough to work on their own. Perhaps it has something to do with my experiences, but I do not like being in the position of a musician who is expected to dictate "how" something should go. As a composer I try to put everything that is necessary for my part of the interpretation into the music, but I don't expect a group to replicate the ideas I have in my head. I expect to hear new ideas, and I expect to hear things I never noticed before. I like to voice suggestions and observations, and I like it when people take my ideas seriously, but the idea of "authority" in a musical situation is abhorrent to me because there is no "authority." Music making often involves making instance-by-instance decisions, and change and inspiration (that often come only through intuition) are the very things that make experiences with music truly meaningful. "Always a Wedding Harpist, Never a Bride!" Who needs viola jokes when you can have harp jokes!
. . . I should mention the story (I think Carrie told it to me) about the harpist who was upset because she was not assigned to play the Beethoven "Harp" Quartet . . .
Two friends sent me this ear-opening video made by Erik Carlson, so I thought I'd share it here. In this sequence of the two opening E-flat-major chords of Beethoven's "Erioca" Symphony from 1929 to 2011, we get a chronological history of recorded music. Through this magnifying glass we hear variations in tempo, length, pitch, articulation, stress, resonance, and many musical factors that don't really have names. 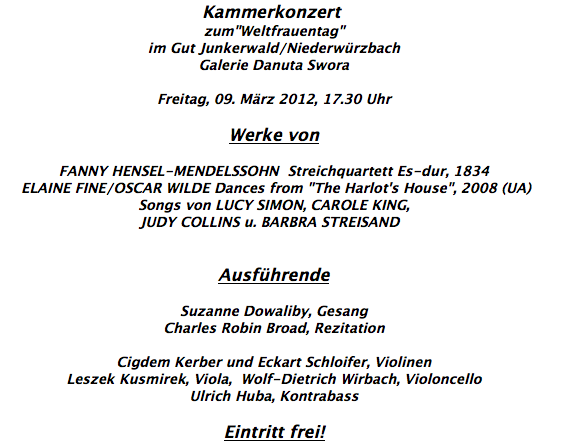 Actually there isn't a harlot's house in Niederwürzbach, but on March 9th there's going to be a concert in Niederwürzbach that includes my "Dances From the Harlot's House," in an arrangement that incorporates a recitation of Oscar Wilde's poem by Charles Robin Broad. 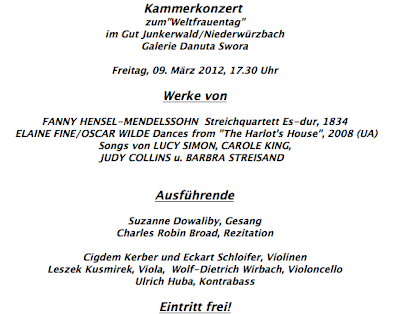 The concert is in celebration of International Women's Day. The musical world is kind of small. Seen through the lens of the internet it becomes big, and sometimes it becomes distorted. I have refrained from making any sort of comment here on the situation at the New England Conservatory involving the firing of Ben Zander because Norman Lebrecht taken up that task, and he has done it rather well. It is all very personal for me because I was a member of Ben Zander's Youth Orchestra (back when it was a Youth Chamber Orchestra). Back in 1974 it was in serious competition for string players with the Greater Boston Youth Symphony Orchestra, and the kinds of kids who opted to play in Ben's orchestra were exceptional in a kind of unusual way. The NEC Youth Chamber Orchestra had less prestige than GBYSO (which was, perhaps, why I had a shot at getting in), but that was only because it was new and small. I remember, for example, Phoebe Carrai, who played with the Youth Chamber Orchestra even though she was a New England Conservatory student, because she enjoyed working with Ben Zander. She went on to do great and, at the time, unconventional things with music. When I first heard the group in 1973, the principal oboist was a Harvard freshman named Kip Wilkins. When I started playing with the orchestra, the principal oboist was Beth Orson, who drove to Boston from Providence, Rhode Island every Saturday. Ben Zander took a chance on me, and he gave me the position of first flute during my last year of high school. In retrospect I think he took a chance on me because he knew my father, who was an NEC faculty member at the time. My friend (since childhood), Susanna Newton (now Susanna Hilliard) was the principal oboist after Beth, and Clelia Goldings was the principal bassoonist (notice that these people are all still in music?). We played, among other things, Beethoven's Second Symphony. Perhaps it was my second year at Juilliard when I took the train to Philadelphia to visit Susanna. We went to a Philadelphia Orchestra concert, and had tickets in the balcony. 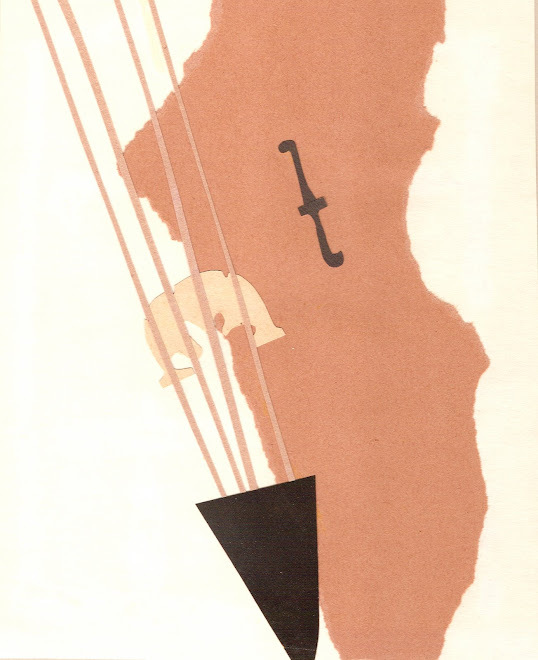 Beethoven's Second Symphony, a piece we knew intimately, was on the program. Sitting side by side, as flutists and oboists are wont to do, we kind of giggled, thinking about our past experience with the piece relative to our position. We turned around, and who was sitting in the "bassoon" seat behind Susanna but Clelia Goldings, who was visiting Philadelphia from her school in Connecticut (Yale)! I kid you not. After the concert Susanna and I listened to a tape of our Beethoven performance with Ben Zander, and we decided (in the most inflated of young adult mindsets) that our interpretation of the piece was superior to what we heard the Philadelphia Orchestra play that evening. I played piccolo in Ben's Boston Philharmonic when I lived in Boston during the early 1980s (where I worked as a typist by day), and have enjoyed following his career as a motivational speaker and as a motivational writer. The adolescent in me still responds to Ben's unconventional way of letting people feel (sometimes even duping them) that they can live up to their potential and exceed their own expectations. Part of his technique for getting young people who want to play like professionals involves allowing the trajectory of a musical phrase to do the "heavy lifting." He likes to give people a sense of collective purpose as musicians, and relies a great deal on intuition. He lets down his inhibitions, and in exchange he expects musicians to let down their inhibitions (which seems like a fair trade). His is a kind of "seat of the pants" approach at times, but it works with young people. It works with musicians, and it seems to work for non musicians as well. Sure, Ben is a bit of a nut. But we're all a bunch of nuts when it comes to living the musical life. Luckily Ben Zander is armed with a brother who is a lawyer, a brother-in-law who is a former Harvard University president, and legions (and now generations) of students who shared the formative experience that I had. It is clear to everybody who follows the story that his firing was an injustice at best, and, more likely, it was a personal vendetta. The people who suffer from this, and with most acted-out personal vendettas between and among adults in educational situations, are children. I have been a long time reader of John Simon, and have admired his criticism for a long time, even when I don't agree with his views. Perhaps I admire him most when I don't agree with his views. It was intriguing to read his take on the film The Artist . He actually found the film "disgraceful," and dismissed it as a silly piece of nostalgia that is inferior in every way to the films it emulates. He doesn't like the fact that the film is in black and white, and he doesn't like the use of Herrmann's love theme Vertigo in the film. It made me wonder if it's a generational thing. After all, if I want to see a great silent film, I could see Wings, that is if it EVER makes it to the top of our Netflix cue, where we have been waiting for it for well over a year. When people make nostalgic films about the 1970s, the decade when I came "of age," I always find false notes. The fashions of the 1970s were horrible. The fabrics were itchy, nobody understood how to make pants that could fit women's bodies, too many people took drugs, there was too much litter, and the air smelled horrible because of the lead in gasoline. The cars, for the most part, were ugly too. And the hair styles. There was terrible racism and terrible sexism. There was also terrible pretension in art and music. And in film, too. The nostalgia for people who were coming of age during the 1970s was the culture of the 1950s, mostly as depicted by the television show Happy Days. I remember asking my aunt if it was fun growing up during the 1950s. She told me that it was very boring. I can accept Simon's dismissal, and could add a criticism or two of my own to his list, but I fear that his fortissimo dislike of the film might have drowned out some of the film's special qualities. I thought that the use of sound in the film was brilliant, particularly during the dream sequence. I thought that the film was a deliberate comic fantasy, just like most of Hazanavicius' other films (which Simon hasn't seen, but perhaps might enjoy). There is a fine line between nostalgia and parody, and I think Hazanavicius, his actors, his crew, and his properties people walk it gracefully. Hazanavicius evokes Herrmann in another film (one of his OSS-117 movies), and it is also quite appropriate. Herrmann represents a generation of excellent American or naturalized American composers who worked in the film industry and brought the quality of American music up to a world-class standard. One silent message (of this silent movie) is how important well-thought-out and well performed music is for the success of a film. The musicians' union protested the use of recorded music in films because it would put musicians out of work (and it did, for the most part), but the Hollywood studios also set the standard for recorded film music to become an art form in itself. I believe that is one reason why Hazanavicius used the Vertigo music in this particular film that concerns this particular subject. We have no idea what the music played in theaters sounded like in America during the 1920s and how much or how little it did to enhance the films the musicians accompanied. We can imagine it to have been great, or, in some cases, and in some cities, and in some theaters, it could have been dreadful. It probably sounded better in Russia. 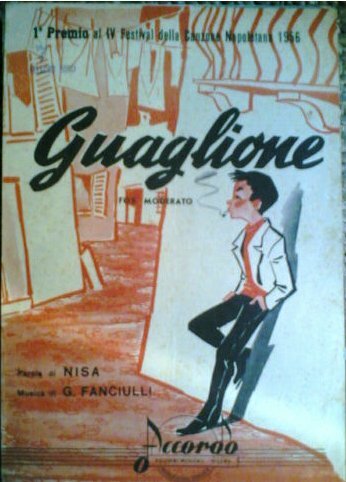 Most of all I'm sorry that Simon missed what I found to be the most poignant film reference of all: homage to the character of Flike in De Sica's 1951 film Umberto D..
More Seymour Barab on YouTube! This part of his Suite for Trumpet, Alto Saxophone, and Piano. Many thanks to Bernie Zaslav for sending this link of Emanuel Vardi in what surely must have been his prime! The piece at the 42:56 mark is Seymour Barab's 2nd Viola Sonata. A person could learn a whole lot about viola playing (and string playing in general) from watching and listening to this guy play. "I write and sing about whatever I am able to understand and feel. I feel that it is healthier to look out at the world through a window than through a mirror. Otherwise, all you see is yourself and whatever is behind you." Until 90 minutes ago I had no idea who Bill Withers was. Michael got a documentary about him called Still Bill from Netflix, and I found it an unexpected treat to get to know the man who wrote so many of the songs that served as the unconscious audio backdrop of my youth (I never knew who wrote them or who was singing because I never "watched" music on television). Withers, who is now in his 70s, demonstrates in the most beautiful way what it is to be friend, what it is to be a father, what it is to be a mentor, and what it means to connect with people person to person and not "personage" to personage. He also defines in practice what it means to have musical talent, and what it means to live through music (as shown through an awe-inspiring recording session he has with Raúl Midón). I supposed you could say that it isn't the "kind" of music I spend my life doing, but it is a "way" of music that I admire greatly. I feel very fortunate to have had the chance, through this film, to spend bit of time with Bill Withers. The folks at Paleofuture have a very interesting post about using recorded music in movie theaters. Now here's a nifty idea! I'm excited to hear these audition videos and to see the way people respond to them. The restrictions and rules of the competition tell us a great deal about the musical world at large, including public domain issues (like circumstances surrounding the Strauss Horn Concerto). A close reading of the rules is an interesting experience. It seems that the people running this competition have made every allowance for this to be a fair competition. Here are the rules, and here is a video about the project. My Father playing Dohnanyi on YouTube! I just happened to find this video from a concert my father played somewhere in Rhode Island back in May. At 81 he still sounds great! I just thought I'd share it here! One of the most eye-opening and ear-opening things I learned from using my new dual-mirror method of practicing is the observation that I have a tendency to move my bow slightly away from the bridge (towards the fingerboard) when I downshift. This causes a bit of instability, which translates into a less-than-consistent sound. My solution? Move the bow ever-so slightly towards the bridge during every downward shift. The results are remarkable! Give it a try if you notice this tendency in your downshifting. Gosh. It's been seven years since I started this blog on February 7, 2005. How could that be? I imagine that my students will ask me tomorrow if I noticed that the Super Bowl ads used classical music. I am not a sports person, and I also know next to nothing about the game of football, but I did watch a bit of the Super Bowl yesterday, and I did shudder a little when I heard snippets from the Scherzo from Beethoven's Fifth Symphony in an ad that had polar bears drinking coke. I groaned an "Oy." Then another polar bear ad used a rendered excerpt from the last movement. There was Rossini in the Doritos, and Strauss in the Camry. Every excerpt except the Glass (which does work well as background music for a commercial) was extremely familiar; the "stock" of ringtone-friendly themes. (I suppose we should give creative points to Coke for not using the first movement of the Fifth). These commercials use themes from pieces of music, not pieces in their entirety. It is kind of like suggesting that a line from a movie IS the movie, or, by extension, "the movies." Don't get me started on the half-time show, or the apocalypse theme that seemed to permeate the commercials. Or the product placement of Twinkies in the end-of-the-world ad for some kind of car that was not a Ford. After seeing OSS 117: Cairo, Nest of Spies last night, I was able to trace the origins of the song sung by Jean Dujardin, the star of The Artist. You can teleport to the updated post here. For the longest time I practiced with these two mirrors on adjacent walls, but it wasn't until I actually hung up the mirror on the right (rendering it useless for anything but practicing), and turned my chair and stand at an angle so that I can see both images without the music stand getting in the way (why did it take me so long to figure this out? ), I never reaped the huge benefits of being able to see what is happening on both sides of the instrument (in real time) while I am practicing. One of the benefits of teaching is seeing the incredible difference it makes to the sound when something a student does looks right (a hand position, a bow hold, the place of the bow on the string, the direction and speed of the bow stroke). This configuration allows me to see the right side of my instrument when I am in upper positions (in the left mirror my hand is always in the way), see my vibrato, watch my shifts, notice when a lower string is being pulled rather than being cleanly stopped, see bow changes, and see the lapses from "ideal" that I miss every so often. Much more often, it seems, than I had imagined. It helps me to be a better teacher to myself. Here is the operative geometry: both mirrors are a the height where I can see my whole playing mechanism while sitting down, which is what works for my particular corner because of the windows. The larger mirror is on the right, and it is 23" wide (minus the frame). The smaller mirror on the left has 19.5" of mirror (minus the frame). The distance from the corner of the room to the 2.5" frame of the right mirror is 28.5", and the distance from the corner to the 2" frame of the left mirror is 45.5 inches. Here's a drawing of the missing violist (made by our son Ben during a concert I played in February of 1999). He was nine at the time. I was 39.